Over one thousand weddings of couples from other countries took place on the spectacularly beautiful Greek island of Santorini this past summer. And the trend shows no sign of abating, as the number of couples who desire to marry on the Aegean island increases every year, Santorini Mayor Nikos Zorzos said. Members of the Santorini community spoke during an event called “Santorini in Athens” which took place at the Acropolis Museum on Tuesday. Santorini officials presented data describing current tourism trends on the island, touting it especially as a wedding destination of choice for many. The island’s mayor said that in the summer of 2018 over one thousand couples got married on the idyllic locale of Caldera as well as other popular spots. At the same time, he said, there were numerous “fake” wedding ceremonies where couples just wanted to be photographed as a bride and groom on Santorini. 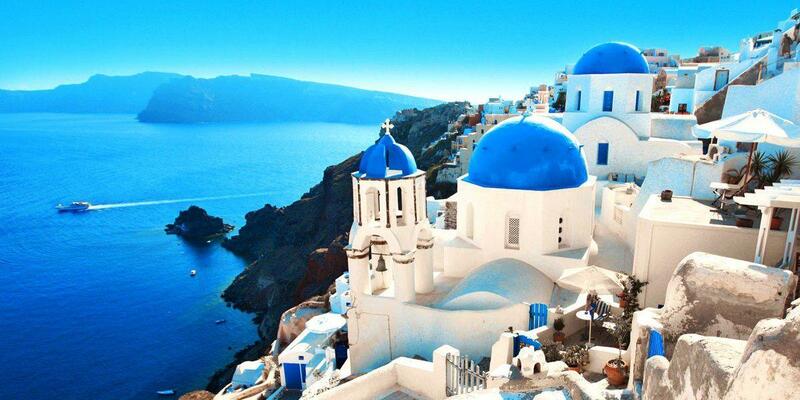 Sixty percent of foreign couples who marry in Santorini are British, according to island figures. The remaining couples are from Europe, the United States, Australia, and New Zealand. As for the many Chinese and Japanese couples who are photographed in wedding clothes, the island officials said that they are nothing more than renewals of vows. They might also be so-called “virtual weddings” because the laws of those countries do not allow official weddings abroad. Santorini officials also described some unusual wedding ceremony requests that they have received and were unable to allow. They mentioned couples who asked to get married inside a submarine at the bottom of the sea and others who wanted their ceremony to take place at the top of the volcano. Regarding overall tourist numbers for the summer of 2018, the Santorini mayor said that about 2.5 million people visited the island through September 30. More than one million visitors landed at the island’s airport, 700,000 came online ships and another 740,000 on cruise ships.